TOKYO, Mar, 28 2019; Three automobile manufacturers--SUBARU, Nissan, and Mazda--are to participate in D-Call Net, which comprises the certified non-profit organization Emergency Medical Network of Helicopter (HEM-Net), automobile manufacturers, and service providers. Now, a total of nine organizations will contribute to improvements in the survival rate of traffic accident victims throughout Japan. D-Call Net, commonly referred to as an AACN (Advanced Automatic Collision Notification), is an advanced automatic collision notification system that uses vehicle connectivity technology. 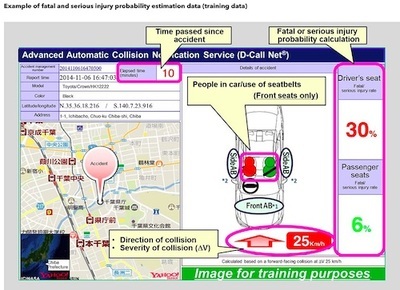 It estimates the probability of fatal and serious injuries by making an automatic analysis of data at the time a traffic accident occurs based on an algorithm using approximately 2.8 million accident data cases in Japan as a base. This data is reported to all of Japan's approximately 730 fire departments, as well as 46 air ambulance services and 54 cooperating hospitals(2) in 37 prefectures, with the aim of increasing the number of lives saved after traffic accidents by making immediate air and ground ambulance dispatch decisions. "The 10th Traffic Safety Basic Plan was drawn up in March 2016; it sought to actively utilize the latest technologies to guarantee traffic safety and to take significant steps toward the realization of a society free from traffic accidents and a world-leading traffic safety society. The key to emergency medical treatment for people seriously injured in traffic accidents is provision of the necessary treatment as quickly as possible--and it is precisely in this area that we must make use of connected and other cutting-edge technologies. "In order to accurately and promptly implement a flow of "traffic accident--transportation--start of medical treatment," in 2011 a group of organizations centering on HEM-Net, Toyota, Honda, and Japan Mayday Service began accumulating data and designing algorithms, and subsequently established D-Call Net; the companies then conducted an operational trial beginning in November 2015. With the cooperation of relevant agencies such as fire departments and hospitals, full-scale nationwide operations commenced in June 2018. 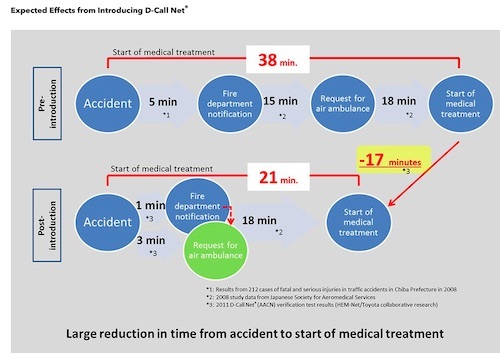 Research shows that D-Call Net? 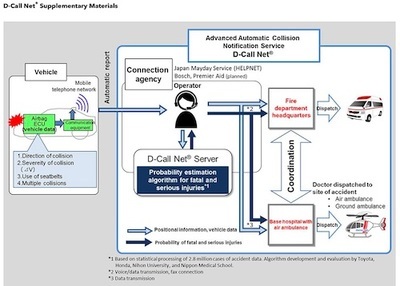 can reduce the time it takes for traffic accident victims to receive first contact with a medical professional by approximately 17 minutes; other findings indicate that if D-Call Net were equipped in all vehicles on Japanese roads, the number of road traffic fatalities could be reduced by 282 people every year. "Going forward, with the participation of SUBARU, Nissan, and Mazda, we hope to contribute both to an improvement in the number of lives saved throughout Japan and to the realization of a society free of traffic accidents, by introducing D-Call Net support into as many vehicles as possible." (1) D-Call Net is a registered trademark of HEM-Net.